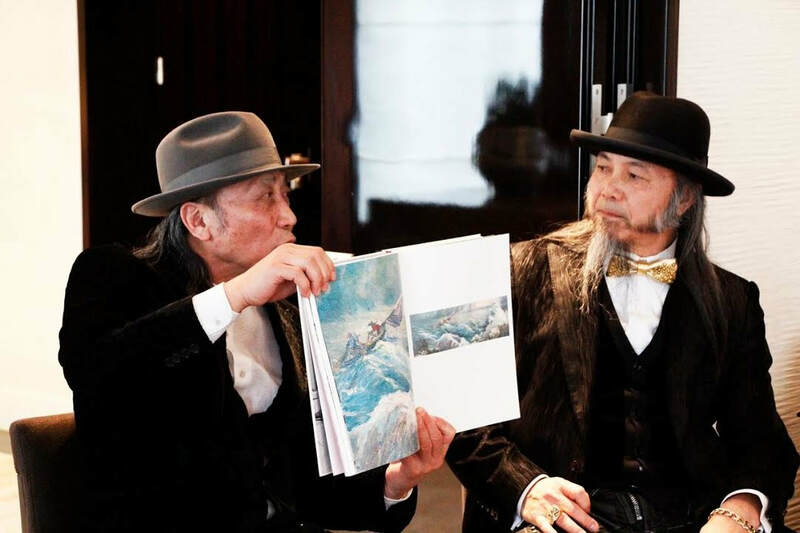 Sinclair Global, a global luxury marketing consultancy providing bespoke experiences across the spheres of art and culture, fashion, gourmet and lifestyle, invited the world renowned Zhou Brothers to London. The Zhou Brothers are one of the most accomplished contemporary artists in the world today, renowned for their unique collaborative work process. They work together on their paintings, performances, sculptures, and prints, often communicating without words in a so-called dream dialogue. Their thinking, aesthetic, and creativity are a symbiosis of Eastern and Western philosophy, art and literature that informed their development since early childhood. A reception took place at The Langham Hotel, welcoming the Zhou Brothers to the inner sanctum of London, before their exclusive event at New Bond Street. “Very few people possess a deeper understanding of collaboration than The Zhou Brothers. 2018 will mark 45 years of collaboration in painting for brothers whose work is, amongst other things, an exploration of the collaborative process and its essential role in creativity. The artists view collaboration as an exercise in discord, or a conversation acknowledging and overcoming difference to achieve harmony or wholeness. It is this context that informs the unique circumstances the Zhou Brothers found themselves in this past week in London. This collaboration forms part of By Appointment, an initiative for the whole of the London Luxury Quarter, the area spanning from Bond Street and Mayfair to Piccadilly and St. James's, celebrating the secrets of the city through intimate behind-the-scenes appointments with artists, designers, masters, makers, Lords and Ladies. One week before the Paris launch and surrounded by the energetic, dark and bold Spring/Summer collection, it was evident that the artists’ work really comes alive when activated in these kinds of ways – drawn into the fabric of the contemporary creative history they are writing, brought closer to the patrons and younger generations their art is impacting, and illuminating this unique yet imminent moment in time when the brothers, finally, made their way to England." ArtAttack was lucky enough to meet with the Zhou brothers beforehand at The Langham and hear more about their lives, artistic practise and future plans. Art Attack (AA): You were both brought up during the Cultural Revolution in China (which ended in 1976) – how did growing up in this context shape your artistic outlook? Zhou Brothers (ZB): This part of Chinese history, no matter how much time passes, is still remembered and extensively talked about today. It is part of a very significant period of China’s history, as the Cultural Revolution impacted so many people’s lives. In China today, people are talking about the generation that grew up during the Cultural Revolution. In some ways this generation of the Cultural Revolution are getting stronger, as we had to survive these difficult times; now some of this generation have become leaders. For us as artists, this time helped make us understand many aspects of life. Can you imagine at the age of 12, being separated and moved to the distant countryside – you are sent to live in a village, with farmers and people you have never met? Here you live together, eat together, and work together; but you don’t have any idea when you can come back to the city, as the future was so uncertain. AA: You started working collaboratively in 1973, but also worked independently as theatrical set designers in the mid 70s – how has your experience in set design / painting influenced your artistic practise? AA: In 1977 you began an in-depth study of folk art in different parts of China; a year later you were both accepted into the Shanghai Drama Institute to study Western painting and modern art – when did you start to combine ancient Chinese culture with modern techniques? ZB: In the late 70’s we were travelling a lot around China. We tried to travel the whole of China in two years; we painted along the way and shipped pieces back home along the way. We also wrote a series of articles entitled ‘A Study of Folk Art’ that were published in several newspapers and art magazines. In China, we feel we benefit from its history and from where we grew up. We decided to travel along the Silk Road to the Gobi desert because you can see so much development in the footprint and in the history. There is a saying in China that when you grow up you have to read 10,000 pages in books and then you have to travel 10,000 miles to experience life first-hand. Our aim was to explore China and really learn the history. After this period we combined this knowledge with what we studied in Shanghai. AA: I’m intrigued by the idea that your process of working together is focused not on the pursuit of harmony, as some might expect, but on the creative possibilities of conflict – can you shed some light on this? ZB: The first piece we did together was in 1973 (‘The Wave‘). Later on and as many years go by some critics say we are painting in a dialogue, however eventually we don’t need to talk and you don’t always need harmony. Our work is not about thinking, it’s about feeling; the painting itself is the conversation. For example, in many paintings, especially our performance pieces, we don’t discuss or attempt to plan a unified vision; we just go together and paint, at first you don’t know anything, that is how the performance pieces often work. We are looking back today on 43 years of collaboration – it is the longest in any kind of art form throughout human history. We have gone through many stages, our whole development is changing; from the beginning talking about harmony, until we realized, actually we need more conflict. But it takes time to realize that. The value of the collaboration is that it opens up things that couldn’t happen any other way. Some times even in music, for example jazz music, they don’t always talk too much about things they just let it happen, ultimately creating more life. We continue our collaboration because we believe this kind of collaboration in art history can add on a lot of new things, and we believe this kind of idea not only in art, but also this collaboration in life. The Zhou Brothers, The Wave, 1973, Oil on canvas, 11.5 x 35 in. AA: In 2004 you founded the Zhou B Art Center in Chicago to provide galleries, studios, and collaborative creative environments for a thriving community of artists; how did this idea become a reality? ZB: We started our foundation in 1991 to help some artists from Europe and China come to Chicago and provided a number of artist residencies. In the early 90s, we finished our fourth major museum traveling show in Europe and in 1996 we accepted a professorship in the Hamburg International Academy of Art and Design. During the following years we taught and lectured at the London International Art Academy (England), Salzburg International Summer Academy (Austria), Traunkirchen Summer Academy (Austria), and Kunstakademie Bad Reichenhall (Germany). We had so many different students from 18 different countries, many of which wanted to come to Chicago to study with us – so we wanted to create a center to give artists and students a place to create and provide a platform to artistic talent and freedom. "The primary purpose of the Zhou B Art Center is to nurture the creativity and growth of its nearly 50 resident artists. In 2004 when my father and uncle purchased an 85,000 sq/ft warehouse building on 35th Street with the ambition to turn it in to a five level multifaceted art institution. Many people in Chicago were scratching their head like, "Have they gone mad?". It was hard to see the vision when you first have a property that has been abandoned for over 28 years. Clearly they were very ahead of their time, and 12 years later looking back we can see the trend – now everyone is now converting their properties into art centers in Chicago. The Zhou B Art Center’s mission is to promote and facilitate a cultural dialogue by organizing contemporary art exhibitions and programs of international scope. As a Center created by artists, for artists, the vision of the Center is to facilitate the exchange of contemporary art between Chicago and the international art community and promote the convergence of Eastern and Western art forms in the United States. ​AA: Have you got any future projects / plans lined up? ZB: We have been developing our philosophy Feelingism – ‘Feeling is Liberty’. This year we have several projects. We are publishing two books – one is a book dedicated to our philosophy of Feelingism and the other book combines the complete history of the Zhou Brothers. We are also planning The Zhou Brothers 45 year retrospective, which will be a travelling Museum show in 2018 and will mark 45 years of collaboration.